I wouldn't say I'm usually a massive monarchist but the Diamond Jubilee unearthed my patriotic side. I think its got something to do with Pose - I want her to understand and be proud of her heritage so I was trying to explain to her about her country and our Queen. I think she understood and by the end of the Jubilee weekend she was chanting God Save the Queen and asking me to sing the national anthem on repeat. It was super cute. 1. Pre-heat the oven to 180°C/Fan 160°C/gas 4. Grease the tins. A baking shop has opened near my office (a baking shop? huzzah! yet more ways to spend when I should be saving....), I bought this little muffin pan especially for this recipe. Its a silicon tray. My first. That's right, I just popped my silicon cherry for the queen. Anyway, I love it and its perfect for little bite-size cakes! 2. 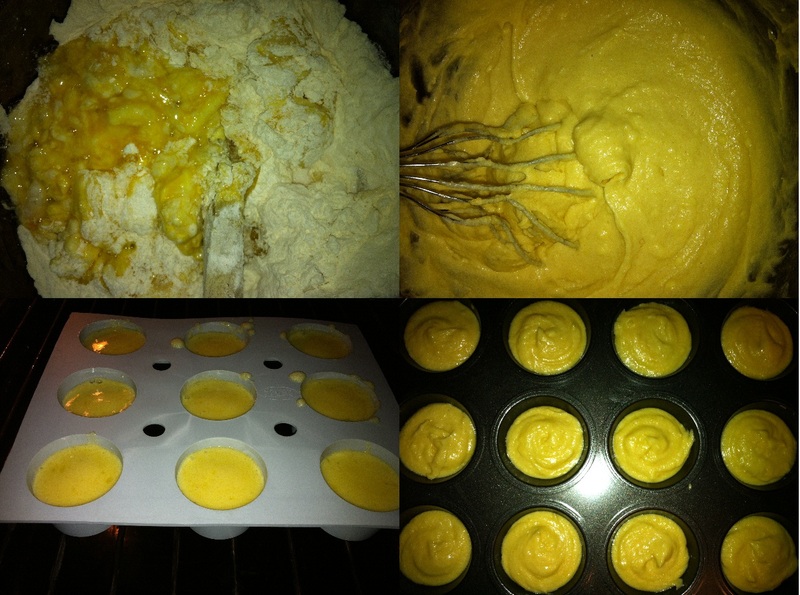 Measure the butter, sugar, eggs, flour and baking powder into a large bowl and beat until thoroughly blended. Fill the mini-muffin tray about 2/3 full and then divide the remaining mixture evenly between the 12 hole cupcake tin and level out. 3. Bake in the pre-heated oven for about 25 minutes or until well risen and the tops of the cakes spring back when lightly pressed with a finger. Leave to cool in the tins for a few minutes then turn out and finish cooling on a wire rack. 4. While the cakes are cooling (they're little so this is pretty quick) make the filling. Take the strawberries and roughly cut them up, then mash them with a fork. You are not aiming for mush though, you are aiming for a crush! Whip the cream till thick and holds its shape. When the cakes are completely cold, you can start decorating. 5. Cut the cakes in half horizontally; dollop some crushed strawberries onto the bottom layer; dollop whipped cream on top of the crushed strawberries; carefully place the top layer onto the cream and press carefully down. 6. Dust the work surface with icing sugar and roll out some of the ready-to-roll icing and taking a cookie cutter or anything you can find - I used a fluted cookie cutter donated by mother - and cut out a circle for each cake. 7. Spread a thin layer of jam onto the top of the cake and carefully place an icing circle on top. Smooth over with flat fingers to ensure it is stuck down. I really loved these little cakes. I was SO SO SOOOOO proud of them. The cake was super tasty (Mary Berry really knows her stuff), the icing wasn't overwhelming, the filling yummy and they looked freaking awesome! 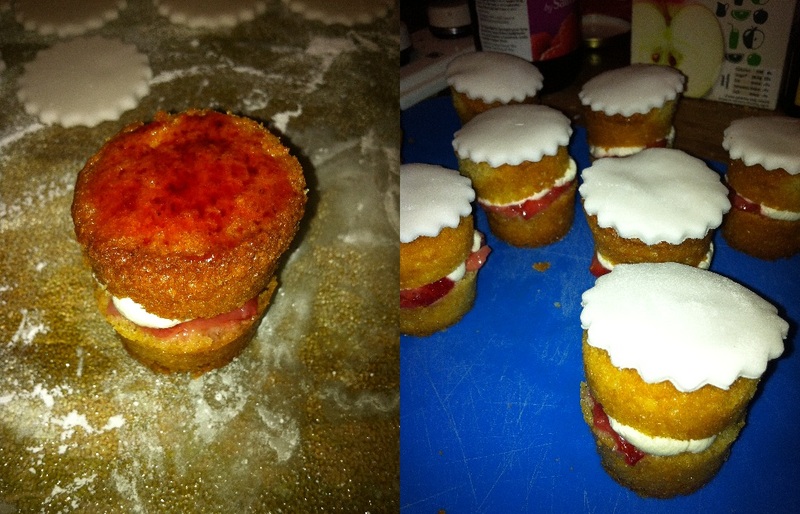 A perfect little cake for our little Jubilee afternoon tea. 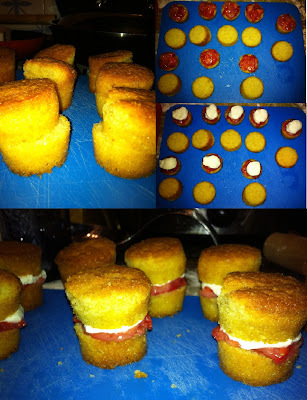 I'll leave you on tenterhooks to see what I did with the Cupcake-Vicki-Sponges....in the meantime you can consider what on earth a "tenterhook" is! ?